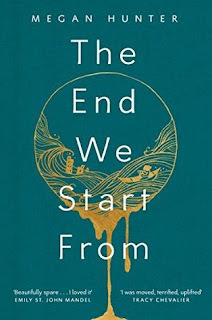 Today I'm featuring the book I just finished, The End We Start From by Megan Hunter, borrowed from the library. I am hours from giving birth, from the event I thought would never happen to me, and R has gone up a mountain. When I text him, he sends his friend S to look after me, and starts down the mountain. This short dystopian novel grabs the reader's attention immediately and doesn't let go. 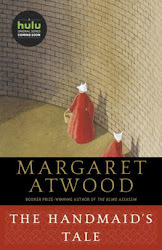 Not only is the unnamed narrator about to give birth, but she and countless others are subsequently displaced by massive flooding that leaves London underwater and sets people on a trek north for higher ground. Fragility, hope, and the search for a viable community are all too real themes in this story of survival set in contemporary times.